Melted cheddar, thick-sliced turkey, grilled onions, and spicy mayo combine into a hot and filling sandwich. So good! I am a sandwich, soup, and salad girl. Inevitably, at restaurants, I will order one or more of those options. 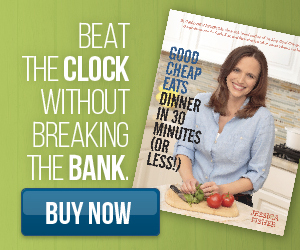 At home, those are my go-to meals. With the right ingredients, I never tire of these easy but potentially flavor-packed soups, salads, or sandwiches. I’m not talking boring white bread with a sad slice of bologna in the middle. Though that does have its merits with a swipe of mayo, some crisp iceberg, and a handful of potato chips on the side. Takes me back to third grade, that does. But, sandwiches have evolved over the years, there are never-ending combinations and flavors that you can stuff into good bread to make a truly great sandwich. When we added a panini press to our collection of small kitchen appliances, it was a game changer. While I love a hot, buttery, “bird cheese” sandwich, the panini press allows me so much more flexibility. I can stuff that sammy full of good stuff and not worry about flipping it and keeping it all intact. 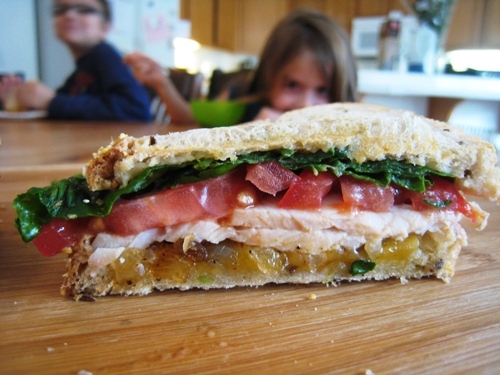 This Turkey Cheddar Melt is one such creation that embodies this formula and makes a great meal. In between slices of rye bread with layers of cheddar cheese, a generous helping of grilled onions, thick sliced turkey breast, tomato slices, fresh spinach, a spicy brown mustard-mayo spread. The order of the components makes a big difference to the success of the sandwich. The cheese is on the bottom next to the heating element. The grilled, chopped onions find structure in the cheese. These won’t fall out of the sandwich because they are glued in by the melted cheddar. The spinach goes near the top right next to the creamy spread. As the spread heats up, it blends with the spinach in quite a nice way. And of course, spinach can stand the heat better than lettuce. It’s all in the design, people. This sandwich is a winner. Go make one today. In a small skillet heat the oil. Saute the onions in the oil until golden brown, about ten minutes, stirring. Season to taste with salt and pepper. In a small bowl, combine the mayonnaise and mustard. Set aside. 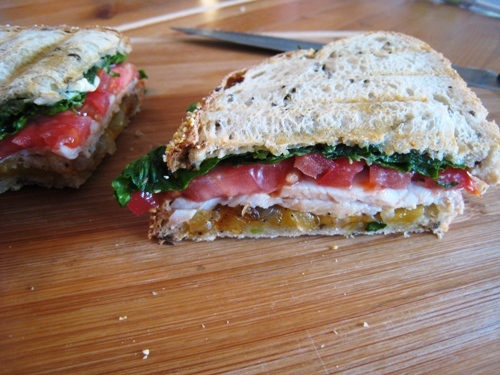 Layer the sandwich as follows: rye bread, cheese, onion mixture, turkey slices, tomatoes, spinach. Spread desired amount of mayo across one side of the top bread slice. Place it mayo side down onto the spinach. Grill the sandwich on a panini press. Serve hot. We have two favorites at our house. On a cold, wet day you still can’t beat the classic grilled cheese sandwich accompanied by a piping hot bowl of tomato soup with homemade croutons floating on top. Our other favorite is a Philly Cheese Steak served with homemade salt & pepper French fries. @Janet, I don’t think I’ve ever had a proper Cheesesteak. What do you put in yours? @Jessica, Well now that all depends on what part of the country you come from. I grew up in Nebraska. There you start with thinly shaved roast beef; caramelized onions and sweet green peppers sautéed in olive oil with a teaspoon of minced garlic; salt and pepper; and melted Provolone cheese all served on a toasted hoagie roll. If you live in Philadelphia Cheeze Whiz is the topping of choice instead of the provolone cheese. @Janet, seriously? Cheeze Whiz? Ugh. We love the cheese steak as well. No Cheeze Whiz here though, it’s Provolone or American. We also love Ruebens with the Thousand Island dressing on the side for dipping. We are in the middle of a snow storm, perfect day for soup and sandwiches! I bought a Cuisinart Panini maker at a yard sale for $5 still wrapped and in the box 🙂 We eat hot ham and cheese or grilled cheese. that being said., the only reason we don’t have one is because I am seriously running out of space in our condo (it’s about 2k square feet…). Instead…I use my waffle iron! My kids LOVE it. And hey, it’s cheaper than coughing up $100 on a press I will inevitably a. break b. drop or c. set on fire eventually.